Somehow, someway, I managed to cross the finish line on Sunday even if it was hopping on one foot! I was so thankful that my Gastroparesis did not flair up during the half marathon and my tummy actually seemed to do pretty well. However, I cannot say the same for my knee & IT Band (the muscle that connects your hip to your knee). 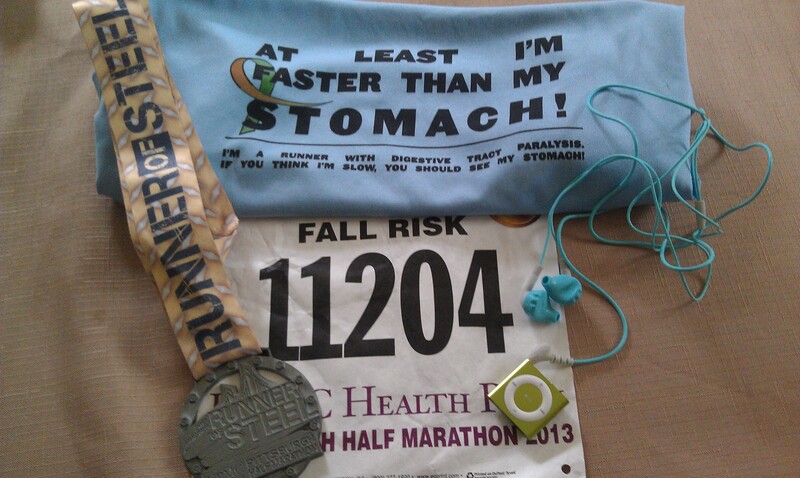 Below is a photo of my actual race shirt, finisher’s medal, runner’s bid (with customized name), & trusty iPod. My race shirt always gets comments during a race. It comes at no surprise that I have to take things slow and occasionally walk due to Gastroparesis, so this leaves plenty of time for other people near me to comment on my shirt. This race was no exception. During the race I received at least a half dozen comments about my shirt. It gets so emotional to be plugging along at a slow pace and have people say “cool shirt”, “thanks for awareness”, “you can do it”, etc. The majority of society does not realize what a major accomplishment it is for someone with Gastroparesis to be able to complete a half marathon. They do not realize how difficult it is for you to keep the proper nutrition in your system to keep your body going. They don’t realize how a flair up can scrap all of the training that you have had to that point or that a flair can prevent you from training at all. This is why I get emotional every time someone comments on my shirt. It makes me realize that there are some people out there that “get it”. My shirt also makes it easy for others to pick me out of a 30,000 person crowd. In my starting coral for the race (the area where you wait for the starting whistle to sound), I ran into a good friend of mine who was fun to chat with while waiting the 30 minutes for the race to start. I also had a former high school teammate see my shirt and gave me a big hug prior to the start of the race. She said that she was so proud of me for continuing to run and that I was an inspiration. Then the race started. It started out pretty rough because I went at too fast of a pace but then had a 3 mile stretch where everything was going pretty well. It was a gorgeous day to run, there was a lot of energy from other runners and the crowd, and my iPod was shuffling to the best songs possible. I was even on pace to meet my goal time. Then my legs started to cramp rather badly. I attribute this to a couple of items: lack of training due to GP flair ups & lack of proper nutrition due to GP. Both of my calves were stiffening up and I could barely walk. This occurred around mile 8 with 5 more miles to go I contemplated giving up and stopping. Then the band along the course started playing some Johnny Cash. So thank you grandpa for once again cheering me on to keep going! Hearing Johnny Cash, missing my Grandpa, and feeling horrible pain in my legs made me an emotional mess. I think that I cried for the next mile. Thankfully a good friend came out to cheer me on and was around mile 9. She saw me coming and gave me a big hug as I was crying. She told me that I could do it and that I could make it. So I dug deep and kept going. This is where Gastroparesis is a bonus. 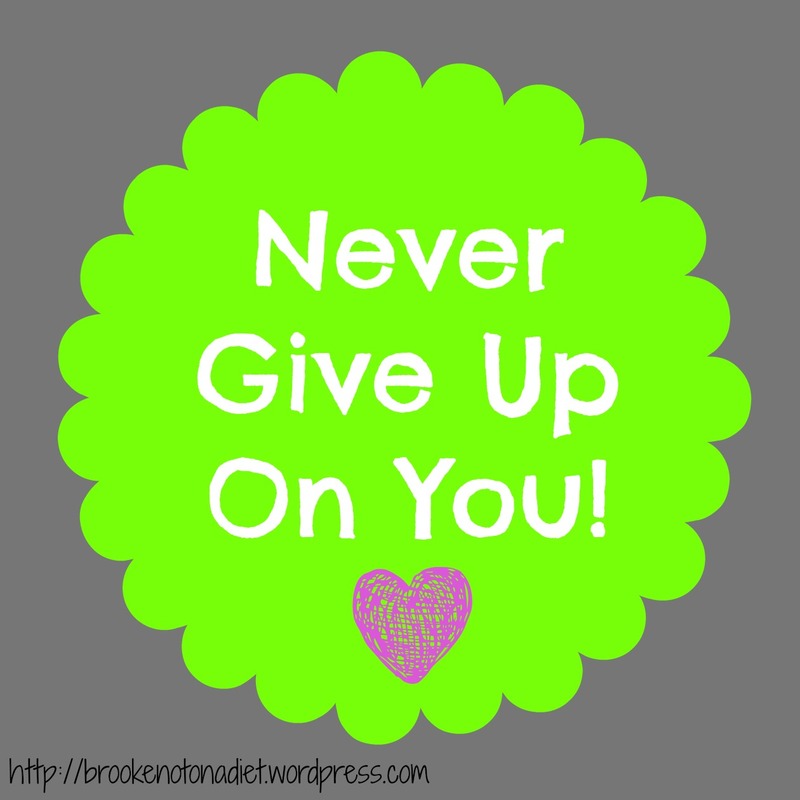 Gastroparesis teaches you how to dig deep and keep going in spite of being an absolute emotional wreck. You have to keep going in life, you have to keep fighting to maintain your life so you learn to block everything else out and keep going. Gastroparesis flairs are also extremely painful so I suspect GPers have a higher pain tolerance than most. I also got extremely angry at GP for taking my training schedule away from me and this gave me some extra fight to make it to the end. However, on the last mile my knee gave out. (In high school I had screwed my knee up pretty badly and it has given me problems off and on ever since.) After all that I had been through for the preceding 12 miles, I was not about to let my knee stop me. I had to finish this race or it was going to be a HUGE mental blow for me. A mental blow that was going to take awhile to overcome. So I hobbled and half hopped my way to the finish. I found my amazingly supportive boyfriend, who gave me a huge hug while the floodgates of pain & emotion opened up. It really takes a special person to encourage someone to keep doing this in spite of the pain and emotional turmoil. Most people would tell you to quit or take it easy or that you are nuts. Yes, I am nuts but it takes someone special to realize how even though my body goes through hell, that I need the emotional victory of finishing more than I need my body in tact. So now, after a visit to an orthopedic surgeon, I am due for a month of physical therapy to repair my damaged IT band. It will be a great opportunity to educate another portion of the medical community about Gastroparesis! Thank you all for the support & encouragement. Your comments (and songs) were running through my head as I fought to finish my 13.1 miles! Suggest a Song to Cheer Me On! Okay everyone! It is time for some audience participation! Are you ready? I hope so! As mentioned yesterday, I am preparing to complete my third half marathon tomorrow! I’ve received several notes of encouragement from my fellow GPers and was wishing that you could all be along the course route to help cheer me on. As I was updating my iPod, I realized that you can be along the course! 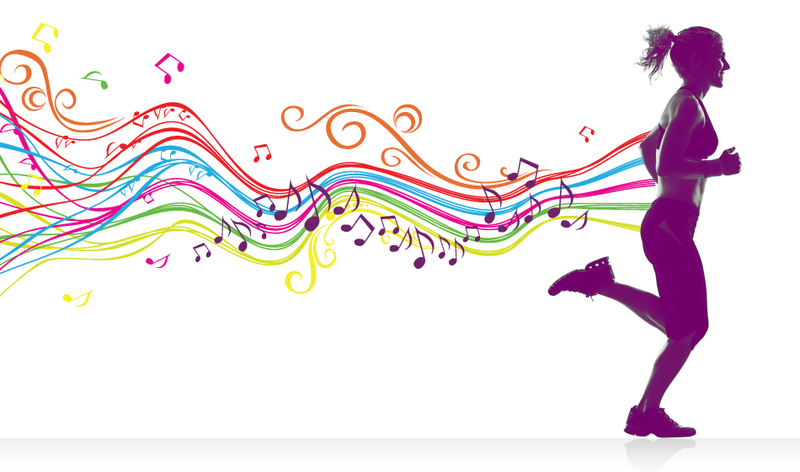 You can be there through music. Here is my request (aka crazy idea which I personally think is awesome)…send me one upbeat song to add into my iPod for the race tomorrow. Then tomorrow when the song comes on, I will think of you & my entire Gastroparesis family that is cheering me on from all over the world. I have no doubt in my mind that hearing songs suggested by you will help giving me the extra boost to keep putting one foot in front of the other and finish the race. Music has always given me an extra boost while running. Sometimes the right song can make all the difference in pace and determination. 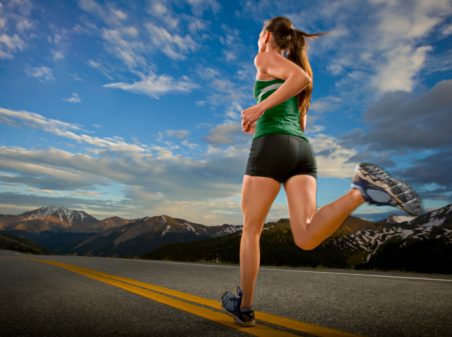 It can help you stretch your stride out. 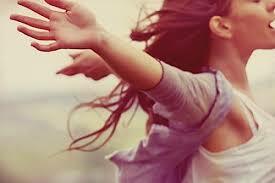 It can help you control your breathing. It can help you remember that even though you are slow that you are still accomplishing something amazing. It can help you control the tears of emotion. It can remind you of just how many people have your back. Tomorrow I will be will be wearing my Gastroparesis race shirt that states “At Least I’m Faster Than My Stomach” and hopefully my iPod will be full of songs that are the voices of my GPer family cheering my on! Looking forward to seeing what will be on the playlist!